Preheat the oven to 200C, gas mark 6. To make the glaze, mix the ketchup, marmalade and half the oil. Brush over the sausages and leave to stand while you prepare the potatoes. Cut the sweet potatoes into thick even-sized wedges about 5cm long and toss in a tablespoon of the oil. Combine the chilli powder, ginger and coriander in a large bowl. Add some seasoning, the potatoes and toss to coat. Place in a large roasting tin and cook for 15 minutes. 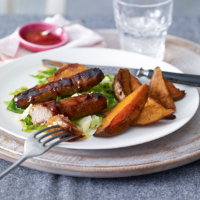 Remove from the oven, turn the wedges over and tuck the sausages between. Bake the sausages and potatoes in the oven for 25–30 minutes until slightly coloured and cooked through. Serve with green vegetables such as frozen peas and shredded cabbage. essential Waitrose Chunky Sweet Potatoes. A relaxing midweek evening meal is perfect with a refreshing beer. Try this – it has the right combination of sweetness and bitterness to complement the marmalade and spice: Brains SA Gold.